In the third change to the iOS App Store's search algorithm in a week, Apple has tweaked how the system weights keyword and app name metadata to allow for more accurate results but the changes could affect app SEO negatively. First noted by Tomasz Kolinko, developer and co-founder of App Store analysts Appcod.es (via TechCrunch), the new changes bring reinstate some of the search functionality lost by last week's algorithm refresh that relied heavily on app descriptions instead of developer-supplied keyword and title data. Kolinko noted that following last week's initial algorithm change his Love Letter Writing app, which carries "advice" keyword metadata, didn't show up when a search for "writing advice" was conducted. When the same query was executed on Friday, Kolinko's app reappeared as one of the top results, illustrating a definite reinstatement of previous search rules. The big news for the devs last week was that if your app was called Dunkin, and your keyword was Donuts, you stopped appearing for a search phrase Dunkin Donuts in the App Store Search. 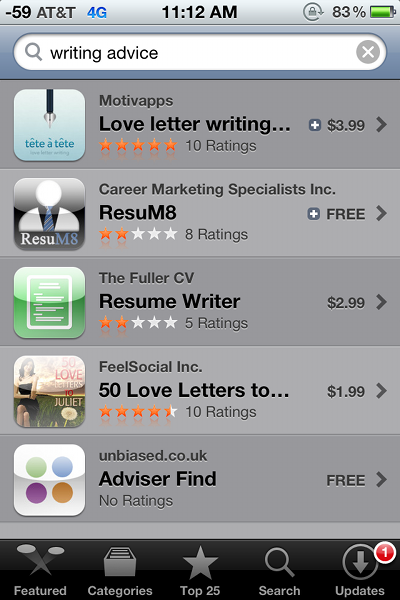 For example, our app, Love Letter Writer, had advice in the keywords and the Apples search didnt show it in the results. We just checked, and this rule is no longer valid. Instagram Camera shows up Instagram again, and Writing Advice shows up our Love Letter Writer again. So do othersearches [sic] that weve tested. Search results for "writing advice." Matthäus Krzykowski, co-founder of app search firm Xyologic, confirmed the App Store's return to keyword and title search rules and guessed that users would be seeing more changes in the future as Apple works to get a handle on the over 600,000 apps. While the new rules and results may not be noticeable to the everyday consumer, Apple's constant tweaking is extremely important to developers who may find the search engine optimization for previously submitted apps obsolete. It is unknown whether the most recent change is a complete rollback or if it based on Apple's recent acquisition of app search company Chomp, but it is clear that the company is experimenting with new ways to handle the App Store's massive catalog of free and premium titles.